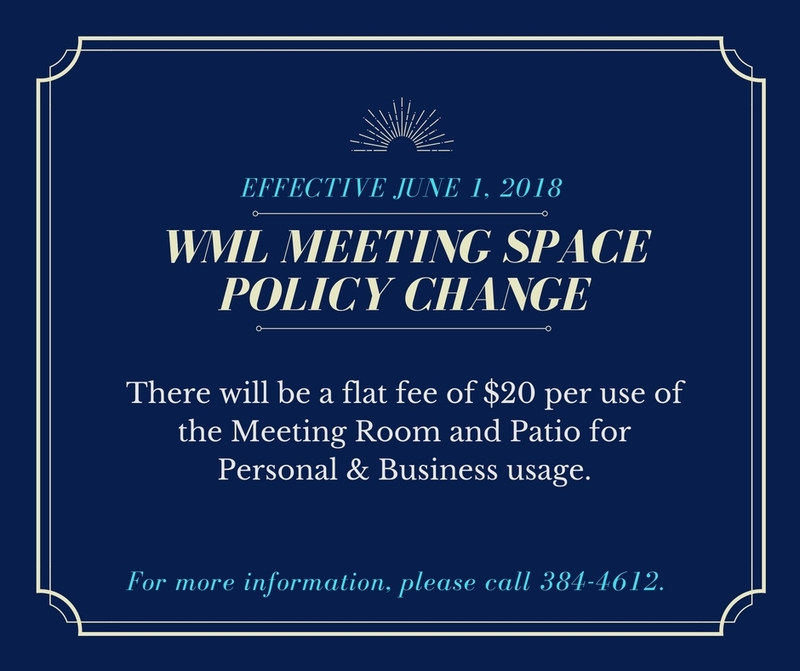 You can reserve the Woodruff Memorial Library Meeting Room for your own event, subject to the policy below. Once you have read the policy, download and complete the application and submit it to the library. The Woodruff Memorial Library has available for use a public meeting room with a thirty-six (36) person capacity, a small study room and a large, covered patio. We welcome all individuals and groups to use the facility. Meetings of any kind are free for city, school and non-profit groups. There are fees for private parties and for-profit entities. There is a flat fee of $20 per use for the meeting room and patio. There is no fee for use of the study room. Payment must be collected at time of application. The spaces will be offered on a first reserved basis. No reservation is required for the use of the study room, although it may be reserved if needed. Reservations are not complete until the WML application form and payment is received at the Library and has been approved by staff. Cancellations made 24 hours prior to use will receive a refund. No refund for failure to notify the Library of cancellation. Failure to notify the Library of cancellation may result in future use being denied. Library programming will have first priority in scheduling room use. Public spaces will be available during regular library hours on a first reserved basis. Requests for single or multiple use dates may be made in person, by telephone, e-mail, fax or online. Dates will be scheduled tentatively but the room will not be guaranteed until the signed application and payment is received at the library. Dates not confirmed with a signed application will be made available to others if requested. To ensure availability to as many groups as possible, public use space may be reserved no more than three (3) months in advance. Applications may be rejected and previously granted permission may be withdrawn for violation of library rules or conduct inconsistent with library rules and regulations at the discretion of the Library Director, as well as for non-payment of fees or outstanding library or other City accounts. In rare instances, the Library may cancel reservations if the room is needed for a Library-sponsored event. Groups must check in at the front desk prior to use, and must check out after use. A count of persons attending will be requested. Clean-up should be completed and all furnishings returned to the original configuration prior to checking out. The person who makes the meeting room reservation is responsible for ensuring that the use of the room is in accordance with Library policies and rules. Juvenile groups must be supervised by an adult. Groups must include any time needed for set-up and clean up in their original request. All uses must end, with clean up completed, and the room vacated no fewer than fifteen (15) minutes prior to closing. Use of public meeting spaces does not constitute sponsorship or endorsement of the views of the user by the Library. Groups may not imply that the Library sponsors their meeting. Publication of misleading notices and advertisements will be considered a violation of these rules and future use may be denied. The user is responsible for all table and chair arrangements, including set up and take down. Library equipment and furnishings must be protected from damage by glue, paint, heat, etc. Candles may be used for decoration but may not be lit. Payment for damage to Library property will be charged to the person/organization reserving the room. Nothing may be pinned or taped to the walls, tables, or other surfaces. Storage space for private property will not be provided. People shall leave public meeting spaces in a neat, clean, and orderly condition including any kitchen equipment used. The user will be responsible for any costs resulting from damage to public use spaces or to a cleaning fee if left in an unacceptable state. In addition, the user will be given notice that continued offence will result in being denied access to the meeting room. Light refreshments (e.g. coffee and cookies) may be served and organizations using Library spaces shall provide all equipment and utensils needed. Clean up is the responsibility of the user. Smoking and alcoholic beverages of any nature are prohibited as per law. Library personnel have free access to enter public use areas at any time. All groups will agree to hold the Woodruff Memorial Library, the Library Advisory Board, and the City of La Junta from any loss, damage, liability, costs, and/or expense that may arise during or to be caused in any way by such use of Library facilities. The Library cannot be responsible for loss or damage to exhibits left in the public use areas or personal property of those attending.